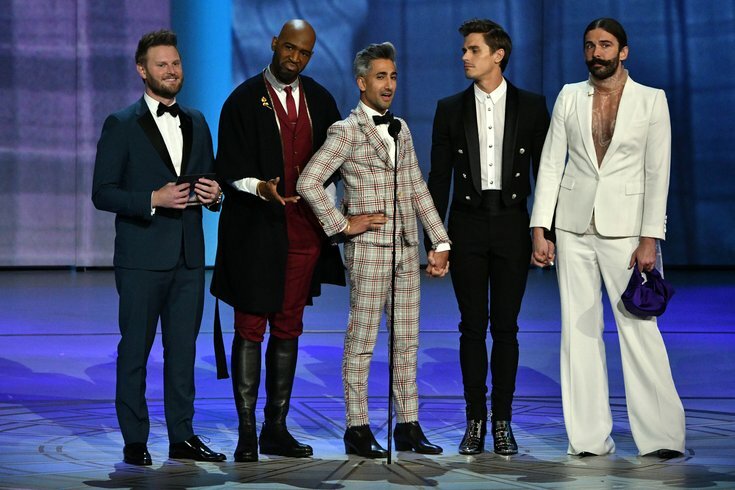 Sep 17, 2018; Los Angeles, CA, USA; The cast of "Queer Eye" presents the award for lead actor in a drama series during the 70th Emmy Awards at the Microsoft Theater. "Queer Eye" is officially back next month, Netflix has announced. It was announced on Wednesday that the beloved makeover show will premiere its third season on March 15. It made the announcement with a video posted to the "Queer Eye" Instagram page, playing a teaser to Carly Rae Jepson's new single, “Now That I Found You." Antoni Porowski, Bobby Berk, Jonathan Van Ness, Karamo Brown, and Tan France are headed to Kansas City, Missouri for season 3 after filming the first two seasons in Atlanta, Georgia. The show was rebooted just a year ago in early 2018, 10 years after Bravo's show "Queer Eye for the Straight Guy" ended in Oct. 2007. People are pretty excited, including the show itself. There's also a rumor that Harry Styles might be on the upcoming special 4-part series in Japan. (It will air after the third season.) The former One Direction member was spotted hanging out with Bobby Berk and Karamo Brown in Tokyo. David Collins, creator for the “Queer Eye," told The Hollywood Reporter that he wanted to bring the show to the Midwest, being from Cincinnati himself. "The show found its legs down south, where we got to see people with different points of view and opinions. Those conversations wouldn't have happened in New York City or Los Angeles. We're really into exploring and letting these guys come into different cities and towns and have their own personal experiences as well."